Tässä pienessä kokeessa havaittiin granaattiomenamehun vähentäneen verisuoniplakin määrää vuoden käytön jälkeen sekä myös verenpainetta. Kolmen vuoden käytön jälkeen ei enää havaittu lisää plakkien vähentymistä tai verenpaineen laskua. Koehenkilöt olivat verisuonitaudista kärsiviä henkilöitä. Dietary supplementation with polyphenolic antioxidants to animals was shown to be associated with inhibition of LDL oxidation and macrophage foam cell formation, and attenuation of atherosclerosis development. We investigated the effects of pomegranate juice (PJ, which contains potent tannins and anthocyanins) consumption by atherosclerotic patients with carotid artery stenosis (CAS) on the progression of carotid lesions and changes in oxidative stress and blood pressure. Ten patients were supplemented with PJ for 1 year and five of them continued for up to 3 years. Blood samples were collected before treatment and during PJ consumption. In the control group that did not consume PJ, common carotid intima-media thickness (IMT) increased by 9% during 1 year, whereas, PJ consumption resulted in a significant IMT reduction, by up to 30%, after 1 year. The patients’ serum paraoxonase 1 (PON 1) activity was increased by 83%, whereas serum LDL basal oxidative state and LDL susceptibility to copper ion-induced oxidation were both significantly reduced, by 90% and 59%, respectively, after 12 months of PJ consumption, compared to values obtained before PJ consumption. Furthermore, serum levels of antibodies against oxidized LDL were decreased by 19%, and in parallel serum total antioxidant status (TAS) was increased by 130% after 1 year of PJ consumption. Systolic blood pressure was reduced after 1 year of PJ consumption by 21% and was not further reduced along 3 years of PJ consumption. For all studied parameters, the maximal effects were observed after 1 year of PJ consumption. Further consumption of PJ, for up to 3 years, had no additional beneficial effects on IMT and serum PON1 activity, whereas serum lipid peroxidation was further reduced by up to 16% after 3 years of PJ consumption. The results of the present study thus suggest that PJ consumption by patients with CAS decreases carotid IMT and systolic blood pressure and these effects could be related to the potent antioxidant characteristics of PJ polyphenols. This study assessed the effect of concentrated pomegranate juice (CPJ) consumption on lipid profiles of type II diabetic patients with hyperlipidemia (cholesterol >/= 5.2 mmol/L or triacylglycerol >/= 2.3 mmol/L). In this quasi-experimental study 22 otherwise healthy diabetic patients, 14 women (63.6%) and eight men (36.4%), were recruited from among patients referred to the Iranian Diabetes Society. The patients were followed for 8 weeks to establish a baseline for normal dietary intake before beginning the CPJ intervention. During the pre-study period a 24-hour food recall and food records (recording flavonoid-rich foods) were completed every 10 days. At the end of the eighth week, anthropometric and biochemical assessments were done. Thereafter the patients consumed 40 g/day of CPJ for 8 weeks, during which time dietary assessment was continued. After completing the study, anthropometric and blood indices were again evaluated. The Wilcoxon signed test was used for statistical analysis. A value of P <.05 was considered significant. Mean (+/-SD) age, weight, and duration of diabetes were 52.5 +/- 5.2 years, 71.5 +/- 10.3 kg, and 7.9 +/- 6.6 years, respectively. After consumption of CPJ, significant reductions were seen in total cholesterol (P <.006), low-density lipoprotein (LDL)-cholesterol (P <.006), LDL-cholesterol/high-density lipoprotein (HDL)-cholesterol (P <.001), and total cholesterol/HDL-cholesterol (P <.001). But, there were no significant changes in serum triacylglycerol and HDL-cholesterol concentrations. Anthropometric indices, physical activity, kind and doses of oral hypoglycemic agents, and the intakes of nutrients and flavonoid-rich foods showed no change during the CPJ consumption period. It is concluded that CPJ consumption may modify heart disease risk factors in hyperlipidemic patients, and its inclusion therefore in their diets may be beneficial. Teettekö mehunne itse granaattiomenista? Biottan mehu maksaa 6,50€ / puoli litraa ja on niin laimeaa, että pullollinen menee hetkessä. Pomegranates were picked by hand, washed, and stored in tanks. The fruits were crushed, and squeezed. The juice was filtered, pasteurized, concentrated and stored at −18°C. Each day along the study period, the concentrated PJ was diluted 1:5 (v:v) with water in order to obtain a single strength PJ. The antioxidant composition of the juice include: 1979 mg/l of tannins (1561 mg/l of punicalagins and 417 mg/l of hydrolyzable tannins), 384 mg/l of anthocyanins (delphinidin 3,5-diglucoside, cyanidin 3,5-diglucoside, delphinidin-3-glucoside, cyanidin 3-glucoside, pelargonidine 3-glucoside), and 121 mg/l of ellagic acids derivatives. The juice contained also 3 mg of vitamin C per 100 ml of PJ. The antioxidant activity of pomegranate juices was evaluated by four different methods (ABTS, DPPH, DMPD, and FRAP) and compared to those of red wine and a green tea infusion. Commercial pomegranate juices showed an antioxidant activity (18-20 TEAC) three times higher than those of red wine and green tea (6-8 TEAC). 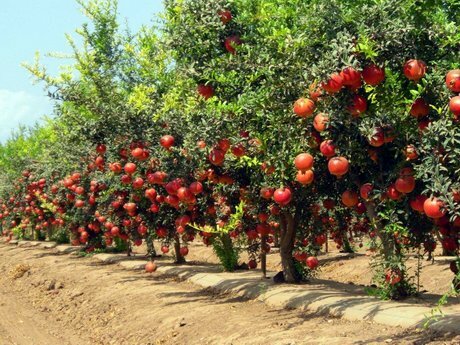 The activity was higher in commercial juices extracted from whole pomegranates than in experimental juices obtained from the arils only (12-14 TEAC). HPLC-DAD and HPLC-MS analyses of the juices revealed that commercial juices contained the pomegranate tannin punicalagin (1500-1900 mg/L) while only traces of this compound were detected in the experimental juice obtained from arils in the laboratory. This shows that pomegranate industrial processing extracts some of the hydrolyzable tannins present in the fruit rind. This could account for the higher antioxidant activity of commercial juices compared to the experimental ones. In addition, anthocyanins, ellagic acid derivatives, and hydrolyzable tannins were detected and quantified in the pomegranate juices. Muistelen joskus laskeneeni, että tutkimuksessa käytetty tiiviste vastasi 2,5 desilitraa luonnollista granaattiomenamehua. ^Siis ilmeisesti 50ml on 1:5 lantrattavan mehutiivisteen määrä. Eli 50ml vastaisi siis 3,0 desilitraa luonnollista mehua. Tuolla määrällä iHerbin pullo riittää 9,5 päiväksi. Näköjään toi iso pullo ei mene siihen halvimman postikulun pakettiin painonsa takia. Katselin, että tuo mehu on alle 30% granaattiomenamehua. Valkoinen tee*, granaattiomenamehu (27,5%), agave-tiiviste* (7%), hedelmäsekoitus* (6%) (päärynäsose*, aronia-mehu*). Biotta myy siis teetä granaattiomenamehuna. Tämä on kyllä tiukkaa tavaraa. 165mg polyfenoleita ruokalusikallisessa. Ei voisi enää hirveän paljon enemmän tiivistää, koska silloin mehu ei enää valuisi pullosta ulos. Joo, menee kyllä tovi kun perkaa puolikkaankin smoothien sekaan. myös siemenet ovat melko ikäviä ja mietinkin että voisi surauttaa ensin mehuksi ja sitten vasta tehdä tuon smoothien.. Tällä hetkellä oli ainakin sokoksella melko halpoja, 3,25e/kg. Joo, menee kyllä tovi kun perkaa puolikkaankin smoothien sekaan. myös siemenet ovat melko ikäviä ja mietinkin että voisi surauttaa ensin mehuksi ja sitten vasta tehdä tuon smoothien..
Itse en ole noita vielä paljoakaan syönyt. Lähinnä lusikalla kaivertanut ja syönyt sellaisenaan. Maku on ihan ok, mutta ei mitään suurinta herkkua yksinään. Heh, tuollakin tyylillä roiskeet ovat melko yleisiä, ja saa kyllä voimaakin käyttää jonkin verran... Millaisissa yhdistelmissä olet itse noita käyttänyt? En itsekään ole erityisen kokenut granaattiomenan käyttäjä ja aiemmin vain pari kertaa lisännyt puolikkaan pallerot muuten lähinnä kotimaisista marjoista ja salaatista koostuvaan smoothieen. Päivittäin tulee granaattiomenoita syötyä, yleensä illan viimeisenä. Helpoiten granaattiomenan käsittely onnistuu leikkaamalla ylin kuori lohkoiksi ja taittamalla kädellä valmis lohko, näin mehut ei valu ympäriinsä ja voit lohkosta napsia herkkuja suoraan suuhusi. Näppärä tapa kuoria näitä on laittaa iso astia täyteen miellyttävän lämpöistä vettä. Sitten leikkaa granaattiomenan kahtia ja murskaa kummankin puoliskon veden alla siten että kaikki siemenet putoaa astian pohjalle. Muu tavara nousee pinnalle, mistä sen voi noukkia/siivilöidä pois. Sitten vaan siivilöi siemenet vedestä pois. Roiskeitakaan ei tule, kun homman tekee veden alla. Itse pidän kovasti näistä siemenistä ihan sellaisenaan. Mä kuorin aina noi valmiiks samalla kun katselen dokkareita, yms. niin ne ovat valmiiksi sitten jo saatavilla. Siemeniäkään ei kannata heittää pois, ne on aika terveellisiä. Youtubessa on monia hyviä tapoja kuoria niitä, mutta koska hedelmä voi olla aika kuiva tai märkä, se luo vähän haastetta.